Highland was settled in 1853 but not incorporated as a city until July 13, 1977! 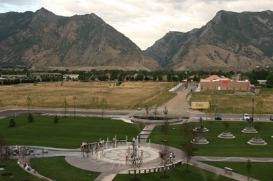 Highland was named for the Scottish Highlands and also for its location on the upper bench at the base of the Wasatch Range, this area has become one of Utah’s fastest growing communities. Highland is home to many natural attractions. it is the gateway to the Timpanogos Cave National Monument and the Alpine Scenic Loop Byway, and also boasts numerous hike and bike trails, including a portion of the Bonneville Shoreline rail. Highland is a safe, family friendly, and beautiful community with lots of natural recreation and diverse economic opportunities. Location, location, location! – Highland is the envy of every home buyers eye. With gorgeous houses, impeccable views and very easy access to American Fork canyon, you simply could not ask for a better real estate location. Easy Access – The completion of SR 92 will provide “commuter lanes” from I-15 to Highland Boulevard, these lanes with provide a direct connection to and from I-15 without traffic signals, these will drastically reduce the commute time for residents of Highland. Employers- With big companies like IM Flash nearby there are abundant opportunities in the Highland area. We pride ourselves on being up to date with all assistance programs that can save you money on your new home. There are Highland specific programs and grants available that we can assist you in securing which will help to make your dream of owning a home in Highland a reality. Contact us today so we can share these programs and incentives to you. The Red Sign Team has been helping people interested in buying or selling Highland real estate for years. Our experts are familiar with the market trends for Highland and Utah real estate in general. We are confident that we will be able to provide you with the friendly, knowledgeable, helpful and experienced real estate service that you deserve. Contact us today!